Once born, the formal division of Europe into two heavily armed camps quickly overshadowed the WEU. In terms of armed strength and support it was apparent that NATO was very much the larger and more important structure. The WEU was further marginalised by the fact that the potentially important role of the quasi-supranational Armaments Control Agency (ACA) was never fulfilled, in part because the necessary economic integration needed to provide the infrastructure was not in place. Since the armaments control aspects of the WEU could not serve as its raison d’être, the WEU was left with its defensive role — one in which NATO was more proficient. 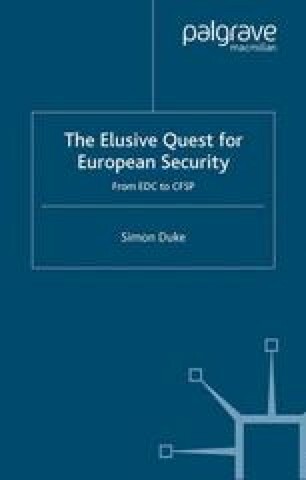 The meeting of the six ECSC foreign ministers at Messina in May 1955 reflected the larger powers’ awareness that in defence and security matters NATO was undeniably the focus of west European efforts.